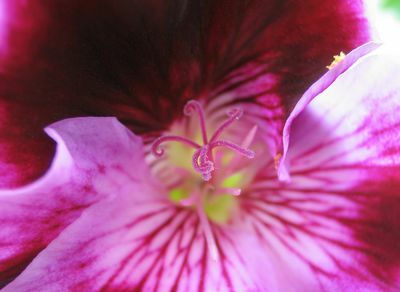 Macro photograph of a petunia flower. Annual petunias are prolific blooming flowers that are easy to grow in most home gardens and flowerbeds. You can also grow petunias very successfully in pots, window boxes, hanging baskets, barrels and many other flower planters. 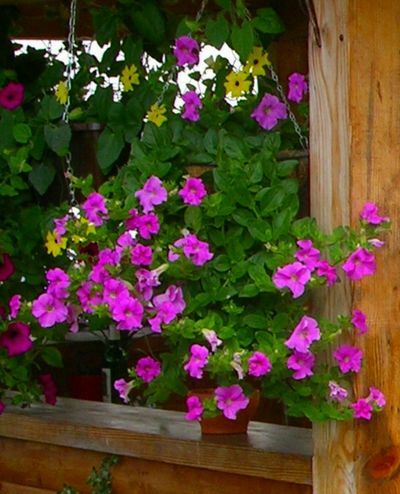 Petunias bloom continuously, from spring to frost, in a wide range of colors and flower sizes, making them ideal for use as single specimens or mass background planting. Grandiflora petunias are the most popular, featuring single or double blooms that are three to four inches across. Some grandifloras have a trailing habit suitable for container growing, while others produce a dense mound from twelve to fifteen inches tall. Multiflora petunias are more compact plants with profuse single or double flowers that add a vivid splash of color to mass plantings. Milliflora petunias produce miniature flowers, a little more than an inch in diameter, making them useful for mixed flower containers or as edging plants. 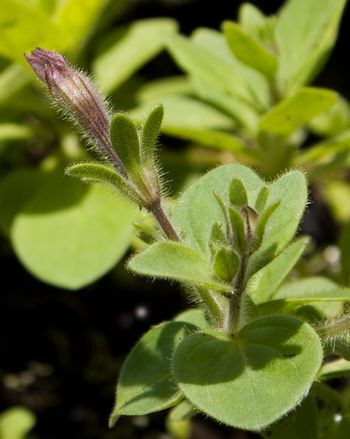 Groundcover petunias hug the ground, growing only about six inches high, but their spreading habit can quickly cover a wide area in densely packed flowers. They trail delightfully from hanging baskets, or over the top of retaining walls. Petunias love the sun. Full sunlight is best for flower production, but five or six hours of bright sunshine can still produce a very attractive display. Petunias prefer well drained garden soil, preferably improved by the addition of compost or manure, worked into the top six or eight inches of soil. A balanced fertilizer is beneficial, worked into the soil before planting, then applied as liquid fertilizer once every three weeks, or two weeks for container grown specimens. Vigorous spreaders should be fertilized weekly. Most petunias thrive in hot weather, providing they receive a good soaking, to a depth of at least six inches, once weekly. Hanging baskets, containers and spreading types need more frequent watering to prevent wilting. Growing Petunias from Seed or Starter Plants? According to the University of Minnesota Extension, petunias can be started indoors, but the seeds are tiny, requiring light for germination, making them a challenge to grow successfully from seed to transplant size, even for experienced gardeners. However, see their instructions for growing petunias from seed if you’d like to try it. Fortunately, garden centers and farmer’s markets stock a wide variety of transplant size petunia plants in the spring. These should be planted outdoors after any danger of frost has passed. Place groundcover petunias about 18 inches apart, or grandifloras and multifloras about a foot apart, in full sun locations; slightly closer if the location is partially shaded. Millifloras should be spaced about four to six inches apart. Protect the new transplants from midday sun for a few days to harden them off. Grandifloras or multifloras should be pinched back once they reach half their full height, to encourage lots of flowering side shoots. Remove wilting petunia blooms to prevent seed production and promote more flowering. This is particularly important for maintaining healthy container plants with lots of flowers.